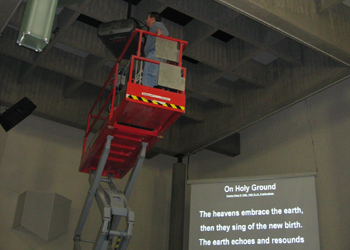 Presentation Partner is well versed in big projectors, big projection screens, and big sound to get your message across. "We have recently completed the construction of our new 8000 square foot community centre. 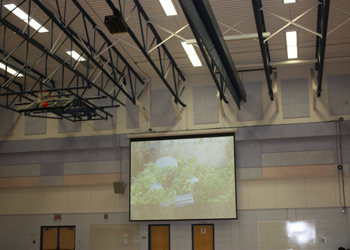 John Bos along with Presentation Partner was very helpful in designing an audio visual system that suited the needs of our building and fell within our budget. John's knowledge and experience answered any questions we had regarding components, installation and choices we needed to make. The system works perfectly and is super easy to use, just exactly what we need! 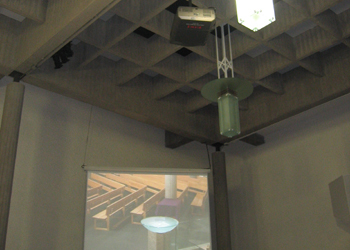 We definitely recommend John Bos and Presentation Partner to anyone considering a new or upgraded audio visual system." Presentation Partner specializes in customized projection solutions that consist of electric projection screens, high brightness projectors, simplified audio systems, user friendly controls systems, and complete cabling packages. Contact the experts for advise on getting your message accross whether it is projecting your image on the screen, broadcasting it to your digital signage network, or streaming it on the internet.